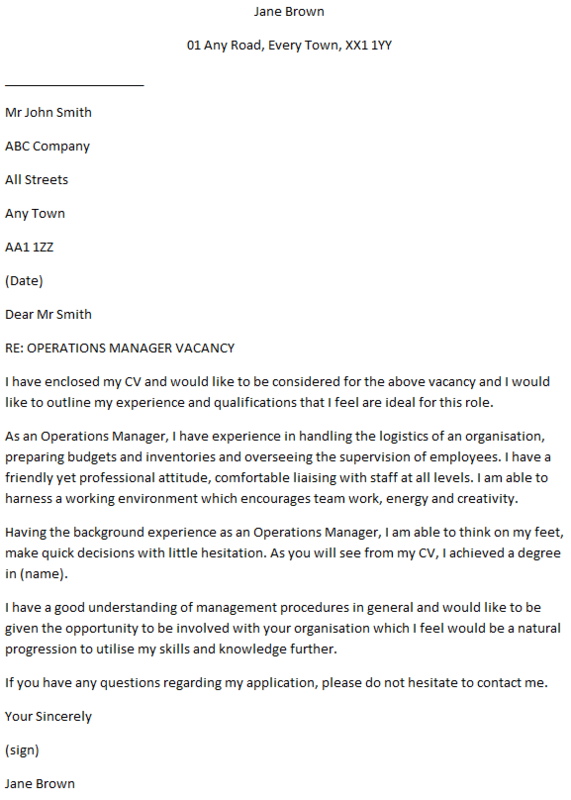 Operations Manager cover letter example. Amend as suitable and use it for your applications. I am sending you this cover letter along with my enclosed CV in response to the advertisement you have at <enter where job listing was found> for the position of Operations Manager. As an experienced Operations Manager who possesses extensive IT knowledge, strong leadership skills and outstanding relationship management abilities, I feel that I would be the ideal candidate to fill your open position. A review of my included CV will confirm to you that I am able to design and implement process improvements aimed at streamlining work while at the same time increasing performance, efficiency and quality. What my CV does not show is the fact that I have the ability to provide motivational leadership to supervisors and key staff members so that they can best develop themselves and their respective departments. I am a technically minded person with outstanding organisational abilities who strives to meet and exceed milestones and goals. I am a natural born trouble-shooter who works very well under pressure and I am well liked and respected by colleagues and subordinates. I hope that you decide to get in touch with me so that we can sit down together to discuss your company and its goals and so that we can go over my application. I feel very confident that I can contribute much to your company’s continued success as your new Operations Manager. I have enclosed my CV and would like to be considered for the above vacancy and I would like to outline my experience and qualifications that I feel are ideal for this role. As an Operations Manager, I have experience in handling the logistics of an organisation, preparing budgets and inventories and overseeing the supervision of employees. I have a friendly yet professional attitude, comfortable liaising with staff at all levels. I am able to harness a working environment which encourages team work, energy and creativity. Having the background experience as an Operations Manager, I am able to think on my feet, make quick decisions with little hesitation. As you will see from my CV, I achieved a degree in (name). With my qualifications and skills for this role, I would be able to research business processes, putting effective measures in place to ensure (company) can run to its maximum productivity. I have a good understanding of management procedures in general and would like to be given the opportunity to be involved with your organisation which I feel would be a natural progression to utilise my skills and knowledge further.